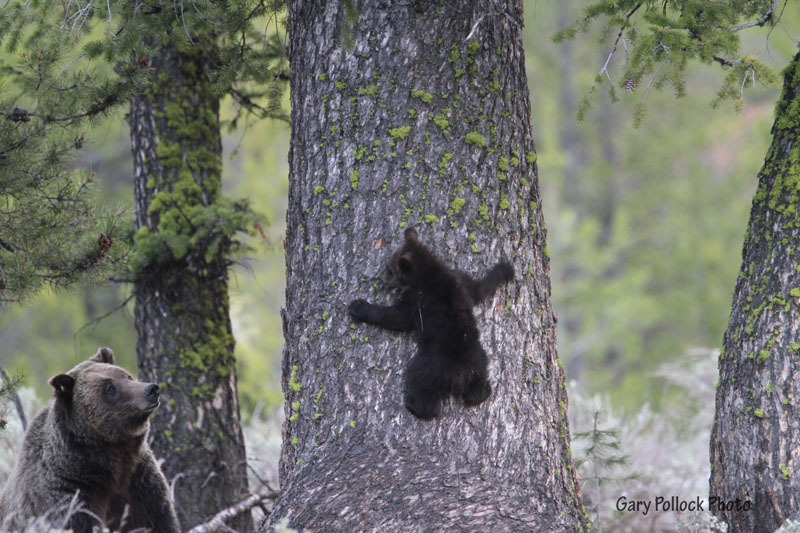 Grizzly bear #610 watches as one of her cubs climbs a tree. Grand Teton National Park biologists report that an interesting turn of events occurred late last week when two female grizzly bears apparently “exchanged” one cub with one another. The two female grizzlies are related (mother and daughter), and have occupied overlapping home ranges since they both emerged from hibernation with their newborn cubs this past spring. The adoption or fostering of cubs between two female bears is rare, but not unprecedented. 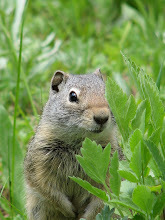 This behavior was documented in an article written by Mark A. Haroldson, Kerry A. Gunther, and Travis Wyman in a Yellowstone Science 2008 publication. Fifteen-year-old grizzly bear #399 (a research number assigned to her in 2001) gave birth to three cubs during hibernation this past winter. Over the spring and summer months, she has traveled with her trio of cubs throughout a home range that she has occupied for several years. Five-year-old grizzly bear #610, born to #399 in 2006, also gave birth to two cubs of her own this year. These two female grizzly bears were previously radio-collared as part of a decades-long research study conducted by the Interagency Grizzly Bear Study Team. Bear #399 last wore a collar in 2006 and #610 shed her collar in 2010. Colored ear-tags remain on the bears, providing continued identification in the field. The apparent adoption of a single cub occurred on or about July 21; the noteworthy event was confirmed by observations of #610 traveling with three cubs in the Willow Flats area of Grand Teton National Park, and later observations of #399 with just two cubs in an area further north of Willow Flats. Biologists are not sure what caused the exchange of offspring, or whether this will be a temporary or permanent situation. However, these observations offer a fascinating glimpse into bear behavior. Scientists speculate that cub adoption in bears is an adaptive behavior that increases cub survival when they become separated from their mothers as a result of conflicts with other bears, the death of a mother, or other disruptive events. The two female grizzly bears and their respective cubs have lingered near park roads over several months time, allowing visitors and local residents an exceptional opportunity to view wild bears in their natural environment. Park managers remind wildlife watchers that all park bears are wild and unpredictable. For the protection of bears and for the safety of visitors, federal regulations require people to remain at least 100 yards (the length of a football field) from bears at all times.